This is another wonderful recipe from Kris Holechek's book, The 100 Best Vegan Baking Recipes. 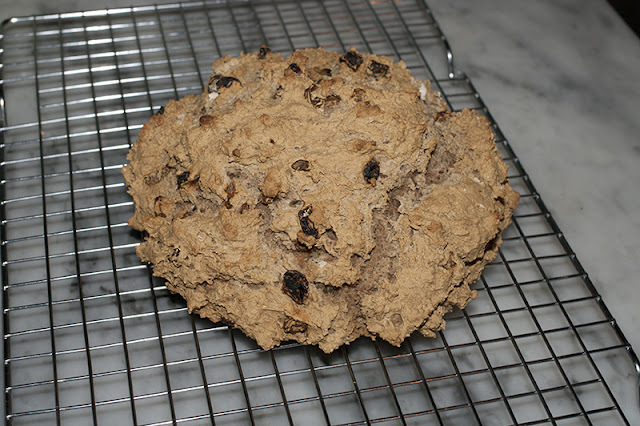 It's another quick bread that is simple to make and delicious to eat. I've made soda bread before, and this is by far my favroite recipe for it, vegan or not. I added cinnamon and raisins to the dough which made the bread taste like cinnamon raisin bread but without the sweetness. We ate it for breakfast, and then finished it off for dessert. Preheat the oven to 400F and line a baking sheet with parchment. In a medium bowl, mix flours, baking soda and salt. In a small bowl, mix milk and vinegar together and let sit for 2 minutes. Create a well in the dry ingredients and pour wet ingredients in the middle. Mix until just incorporated, and shape dough into a ball. Dough may be a little floury on the outside and that is fine. Place dough on a baking sheet and bake for 30 to 35 minutes or until bread is browned and sounds hollow when tapped. Let cool 15 minutes before serving. Store leftover bread covered at room temperature. Yum, adding cinnamon and raisins sounds awesome! I've been a vegetarian since I was a teen (30 years), and I love trying new foods and recipes and kitchen experiments. I live in Northern California with my husband and our many critters. I have over 300 cookbooks and I love to use them! If you want to know even more about me, you can read this post.